It has been more than 500 days since Rick and Morty season 2 ended with that big cliffhanger. And we still are awaiting the arrival of new episodes. Adult Swim has been providing us with little teases here and there, but very little is known about Rick and Morty Season 3 and we still don't even have a premiere date. Today, they have really outdone themselves by providing the most genius and at the same time unreasonably frustrating tease for Rick and Morty season 3 imaginable. The Austrailian Adult Swim YouTube channel uploaded the clip online, which promised fans an exclusive look at the opening scene from Rick and Morty season 3. Instead, the video is a massive Rick Roll. The video uses a ton of various clips and dialogue from preexisting episodes of Rick and Morty that are arranged in order to recreate Rick Astley's "Never Gonna Give You Up." Well played, Adult Swim. Well played. Shortly after the video aired, Adult Swim Australia issued this apology. Rick and Morty creators Dan Harmon and Justin Roiland have been hard at work on season 3 for quite some time now, but there have been delays along the way that have caused production to take longer than we would like. For one, Adult Swim upped the episode order from 10 to 14 for Rick and Morty season 3, which will ultimately be a good thing once the show finally starts airing again, but it has taken longer to complete the episodes since there are more of them to do. Also, Dan Harmon recently said that he and Justin Roiland are personally to blame for the delay, stating that the show is simply taking longer and longer to write with each passing season. "I don't have a release date for Season 3. It's not that I know it and I'm not allowed to say it; it's [Adult Swim's] domain. What I will tell you is it's late because of us, it's late because of me. If Justin were here he'd agree. He and I would go, 'Yeah, we f#*!ed up,' and it's hard to put your finger on how we f#*!ed up. Rick and Morty keeps taking longer and longer to write, and I don't know why." In case you are one of those who hasn't jumped on the Rick and Morty train yet, after having been missing for nearly 20 years, Rick Sanchez suddenly arrives at daughter Beth's doorstep to move in with her and her family. Although Beth welcomes Rick into her home, her husband, Jerry, isn't as happy about the family reunion. Jerry is concerned about Rick, a sociopathic scientist, using the garage as his personal laboratory. In the lab, Rick works on a number of sci-fi gadgets, some of which could be considered dangerous. But that's not all Rick does that concerns Jerry. He also goes on adventures across the universe that often involve his grandchildren, Morty and Summer. At the moment, Adult Swim hasn't even announced an official release date for Rick and Morty season 3, but we can be sure it will air at some point in 2017. This clip may be a bit frustrating, but it is impressive and definitely funny, just maybe not in the way we were hoping. At least it is something to help fill the void while we impatiently wait for new episodes to finally arrive. Be sure to check out the new Rick and Morty video for yourself below. In a recent post, writer Mike McMahan tweeted that voice recording for the first Season 3 episode has begun. 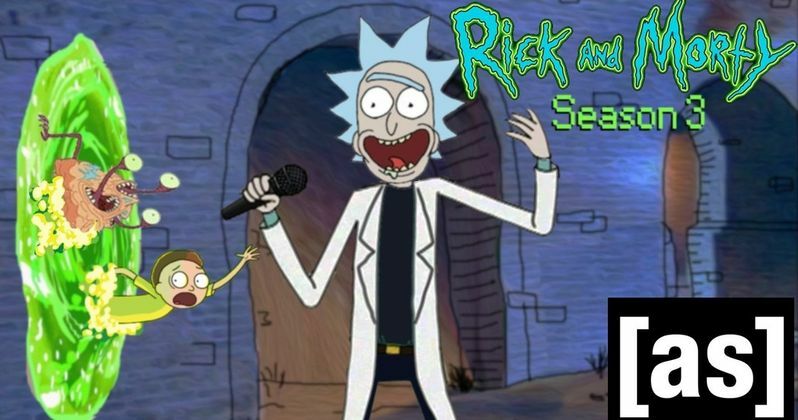 What's the Hold Up on Rick and Morty Season 4?